Welcome to the 12 week curriculum. Below you will find 4 modules which link to 12 weekly lessons (3 per module). Within each module you will find topics to help you implement each lesson. We've purposely kept the content short. The modules are designed to give you quick access to each topic. There are more topics presented early in the program to get you started, with less later while you are developing your team's app and pitch. Click on the module to see the weekly lessons. Here is an overview of the program. Download here. Get started by identifying a problem in the local community to solve. Meet your mentor and work out a regular meeting time, and topics to discuss. Start your business plan and document your decisions about the problem and how others have attempted to solve the problem. Evaluate your favourite and least favourite apps. What are their strengths and weaknesses. Conduct market research to see how your app will fit into the marketplace. Create your wireframe for your app, and consider navigation and key functions of the app. Learn how to design and film a great pitch and demo video. Work on your business plan including revenue models, marketing, distribution. Prepare and film your demo and pitch video. Finalise your business plan and your prototype. and export your source code for submission. Flex week to finalise all deliverables and submit for judging. Download this image for printing here. Use this time zone converter to find out the correct timing you need to submit the application by. The submission platform will be announced closer to submission date. Please read the submission guidelines and judging rubric carefully before starting your project. You must upload ALL DELIVERABLES for your division to be eligible for judging. 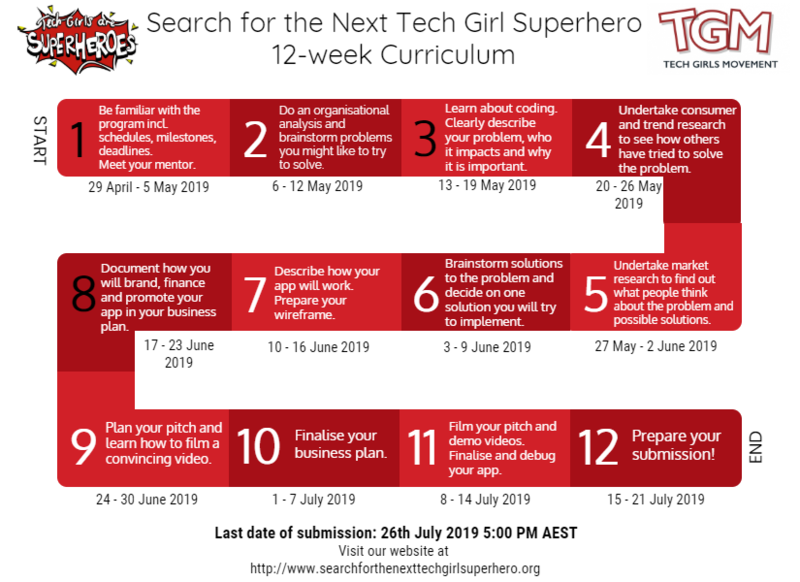 Submit whatever you have for each deliverable by July 26, 2019, 5:00 pm AEST, even if it isn't perfect. We cannot judge incomplete submissions, so don't leave any deliverable out of your submission. The judging rubric is here.